Now that my number of open bottles is down below 40 I’ve begun to finally open a bunch of not particularly exciting bottles that I purchased some years ago in my great hoarding period and put away for no good reason. 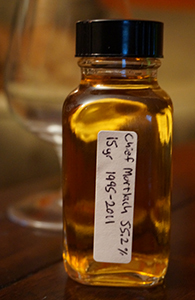 This Mortlach from Signatory’s UCF line was one of those. I opened it a few months ago for one of my local group’s tastings and while it did not set anyone’s hair on fire, almost everyone liked it. I’ve been drinking it regularly since then and here now are some formal notes. Nose: A little metallic; raisins, a bit of orange peel and a bit of dusty wood. Not a whole lot of interest. A little more expressive with a few drops of water but still not particularly interesting. Gordon & MacPhail have a Mortlach 15 and a Mortlach 21 in fairly regular release and I’ve always been very curious about both. I’ve never pulled the trigger on a purchase both because I’ve heard inconsistent things about both bottlings (and there’s no year of release or batch number clearly marked) and because the prices I’ve seen have always seemed a little high for non-cask strength indie releases. Accordingly, when this 21 yo went on sale in Minneapolis last year I finally went for it. I opened it as the lead whisky in a tasting of older malts with my local group late last year and while it was no one’s favourite it put on a decent show in the company of some higher powered malts (including this Archives Bunnahabhain and this Scott’s Selection Glen Grant). Mortlach has been in the news a lot this year with the launch of their hyper-expensive new line. Prices of indie casks from the distillery seem to also have gone up a little as a result. It will be interesting to see if things remain that way in the long run. Diageo may want to protect the new profile of their brand by making fewer casks available to the indies but if production is also going up (a big if) then more casks will become available anyway. At any rate, this is not a recent release. It was released in 2011 by Ian Macleod’s Chieftain’s Choice label. This label used to be quite ubiquitous in the United States once upon a time, but I haven’t noticed too many new releases—not that that means very much given my general level of obliviousness and my disinterest in reading press releases and marketing materials. This was a bottle I thought hard about when it was first released but after tasting it at a Minneapolis store decided against it. 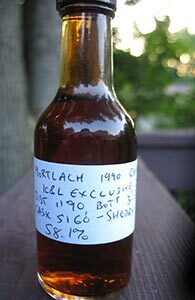 I did love an older Mortlach bottled by Chieftain’s for K&L and so always wondered if I’d given unfair short shrift to this one. And so I’m very glad to be able to review it again from a large’ish sample. I am looking forward to reviewing a K&L exclusive 22 yo Mortlach from Chieftain’s tomorrow (well, later tonight, but it will be posted tomorrow) and thought that to calibrate I’d pour myself some of the only other Mortlach I have open, the beloved 16 yo from the “Flora & Fauna” series. 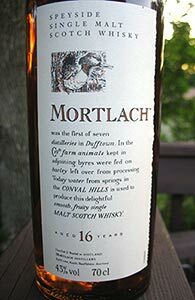 Mortlach, a Speyside distillery, produces a lot of malt for Diageo’s blends. This is the only official bottling available regularly as a single malt. Their spirit is partially triple-distilled (as at Springbank, though Mortlach apparently has a particularly odd configuration of stills) and they are also one of not very many distilleries left in Scotland that uses wooden worm tubs to condense the distilled spirit. 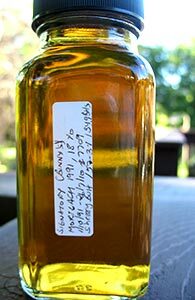 The reduced copper contact results in less removal of sulphur compounds than at most distilleries and this in turn results in a meatier, more savoury spirit. I’ve had a number of intense single cask releases of Mortlach from the independents but there’s something about this gentler, simpler 16 yo that I really like.